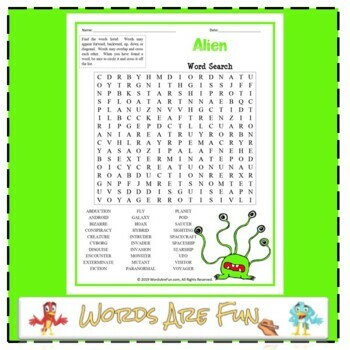 A word search puzzle featuring words associated with aliens. This word search will get you into the right mindset for local UFO sightings. Use this sheet as part of your teaching curriculum, a treat for early finishers or just for fun. Word List: Abduction, Android, Bizarre, Conspiracy, Creature, Cyborg, Disguise, Encounter, Exterminate, Fiction, Fly, Galaxy, Hoax, Hybrid, Intruder, Invader, Invasion, Monster, Mutant, Paranormal, Planet, Pod, Saucer, Sighting, Spacecraft, Spaceship, Starship, UFO, Visitor, Voyager.